Ludum Dare 41 is in the books! What Is The Christmas Trail? 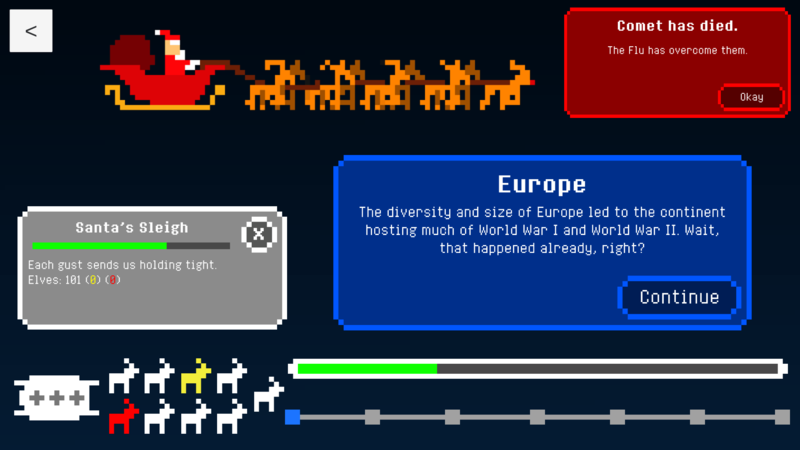 The Christmas Trail is a game based off the 1974 hit educational video game The Oregon Trail. I’m not entirely sure where this game idea actually came from. I’m a big fan of Christmas time, and I tend to theme my crazy game ideas as such. There was a time I was very keen a dwarf fortress-like game based at the North Pole, where the elves were the dwarves and the goal was to please a rather eccentric Santa Claus and his over-the-top demands… but let me stay on topic.